This group includes grackles, blackbirds, cowbirds and starlings. With the exception of the starling (family Sturnidae), these birds are from the family Icteridae. Images include Brewer’s Blackbirds, Brown-headed Cowbirds, Great-tailed Grackles, Red-winged Blackbirds, Rusty Blackbirds, Tri-colored Blackbirds, Yellow-headed Blackbirds, and European Starlings. 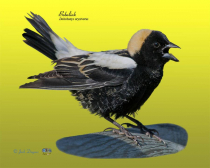 Like most members of this "Blackbird" clan, the Bobolink is in the family Icteridae. While the breeding range for this bird is in the northern half of the USA and some of southern Canada, they winter rather far south in the south central regions of South America. Prime breeding habitats are open grassy fields, especially hay fields, across North America. States I have seen this bird often in the Great Basin. 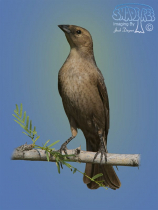 Cowbirds are well known nest parasites. It is thought by some theorist that it evolved this practice when it used to follow the great bison herd migrations that roamed freely from present day Mexico to Canada. To keep up with the migration, these birds would deposit their eggs in other bird's nests. Their young develop much faster than that of their hosts, so the host's offspring do not survive. 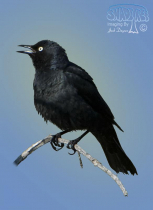 The Great-tailed Grackle ranges over most of the southern west of the USA. Though it breeds slightly north, it is a year round resident in Southern California, Arizona, New Mexico, Texas and Mexico. 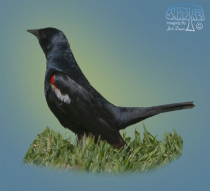 The Red-winged Blackbird ranges year round over most of the lower 48 states in the USA, but can be a breeding bird far north into Canada. The Rusty Blackbird prefers wet forested areas, breeding in the boreal forest and muskeg across northern Canada, and migrating southeast to the United States during winter. 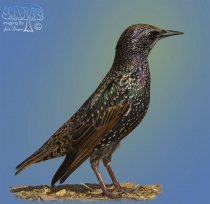 Not a 'true' blackbird, European Starlings were first introduced to the United States in 1890. It is believed that one hundred starlings were released in New York's Central Park in hopes that all of the birds mentioned in Shakespeare's works would become established in the New World. 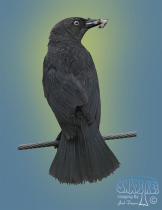 There are reports that now this bird can be found in the four corners of the earth. The Tri-Colored Blackbird is nearly confined to distribution in California. Habitat loss is threatening its survival. Closely related to meadowlarks, the Yellow-headed Blackbird breeds in reedy marshes overmuch of the western and north central USA.